Kehlani and PartyNextDoor used to date, pretty publicly at that, before calling off their relationship last year. PND recorded a song called “Kehlani’s Freeystyle,” that cleared the air on the affair and spoke openly about his failures as a boyfriend. Months later, there were rumors circulating that Kehlani had started dating Cavaliers point guard Kyrie Irving. 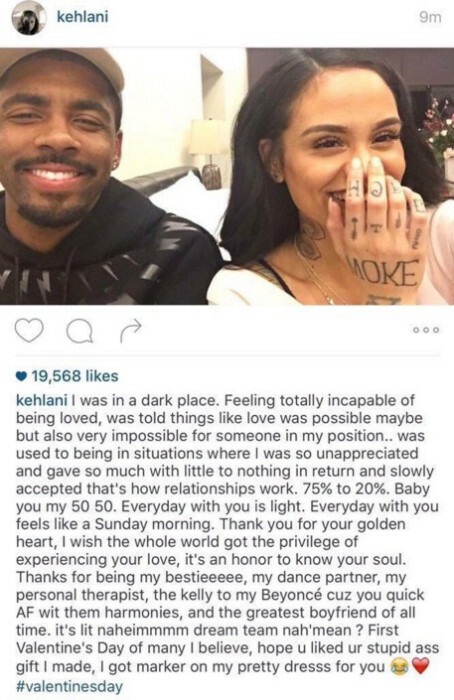 The news was shortly confirmed via Instagram, when Kehlani posted a very enthusiastic Valentine’s Day post. On Monday (March 28), PND posted an insinuating photo to his Instagram that has since been deleted, hinting towards their romantic reunion. 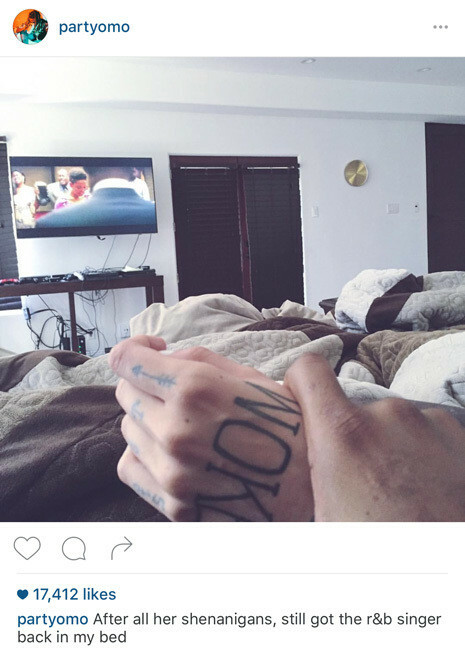 Kehlani’s famously tattooed “Woke” hand appears in the flick, which shows the two laying in bed. PND announces his and Kehlani's reunion? Much to our surprise, and unfortunately Kyrie’s as well, Kehlani was back with PND and clearly had some explaining to do. But then again, could the photo be old? Were her and Kyrie not dating anymore? Entirely possible, let's be honest, it is social media. Despite the truth of it all, within a matter of minutes, fans, naysayers and just about anyone who had their two-cents about the matter, held no punches. Quickly flooding comments and timelines on Kyrie’s accounts, with hate scare tactics against the R&B singer. Unfortunately, before all parties involved could justify actions, the situation took a turn for the dark when Kehlani posted a photo (since deleted) late-last night, with a caption that implied she had tried to take her own life. 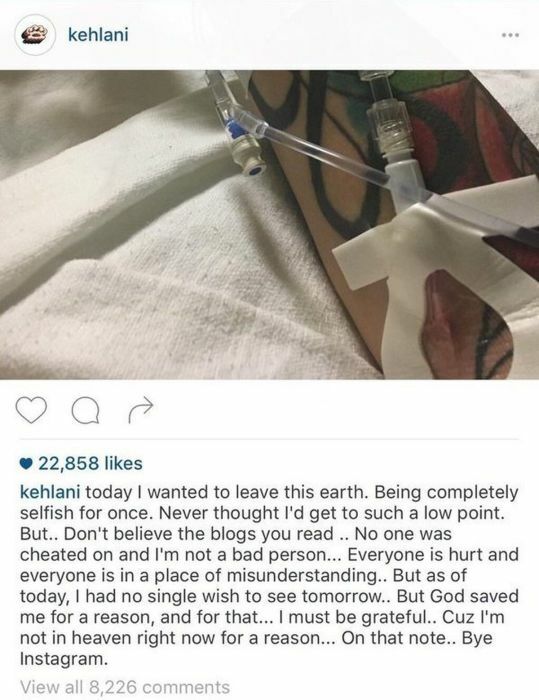 She also shared a photo of PartyNextDoor sitting by her hospital bed with the caption, “thank you for saving my life.” Shortly after, Kehlani swiftly deactivated and deleted her Instagram (she previously had deactivated her Twitter account). Leading many to assume this was a guilty maneuver and way to dodge the blatant crucifixion. Regardless of the fact, we are all humans with flaws capable of growth. When problems happen, our mental state changes and our decisions are distorted. Though mistakes are irreversible, they are also without reasoning and no place for judgment. Chris Brown, for his part, and social media star Mia Khalifa weighed in to jeers. Meanwhile, #StayStrongKehlani has been trending on Twitter throughout the day. It's been speculated that the singer is being held in the psychiatric wing of a hospital while she's evaluated, however, at press time there have been no further details. In the end, it all comes down to respecting other people’s private matters, and though Kehlani, Kyrie Irving and PartyNextDoor are stars, we all have our own lives to deal with. Best of wishes and blessings to everyone involved. Tags: kehlani attempts suicide following kyrie and partynextdoor scandal "god saved me for a reason and for that i must be grateful.